Bring a large pot of water to a boil. Add pasta with a pinch of salt and cook al dente. Meanwhile, on medium heat, add butter and olive oil to a dutch oven or large skillet. When butter has melted, add and saute garlic for 1 minute. Add chopped onions and white wine and simmer for 2 minutes. Add tomatoes and fresh basil, cooking for 3-4 minutes, until tomatoes soften. 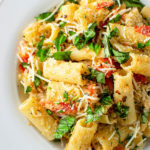 Strain the rigatoni and transfer to the skillet with the garlicky tomatoes. Fold until full coated in the sauce. Stir in the Parmesan cheese and breadcrumbs and serve immediately. Top with additional fresh basil, and Parmesan cheese if desired. Garnish with crushed red pepper flakes for extra kick.